There are parallels between Melbourne’s East West Link and Sydney’s WestConnex. Crystal Legacy and Daniela Minicucci explore the East West Link community campaign and what Sydneysiders might learn from it. A modest crowd gathers on a crisp January morning in 2014 as the sun rises over Fitzroy, a multi storied suburb in Melbourne’s inner north. The area is deep into its latest cultural re-awakening, a shift that will elevate these once grungy, bohemian badlands to the highest ranks of the city’s most trendy and desirable suburbs. It is early 2014 and while Fitzroy finds its footing with the hip, young professionals of the new cafe class, about 50 long-time local, activists and other passionate Melburnians have taken up residence on a grassy patch of land wedged between one of the city’s busiest commuter thoroughfares. They are here in peaceful protest to stop the proposed East West Link, an 18 km tolled road connecting the city’s Eastern Freeway with the CityLink urban freeway and the Western Ring Road transport corridor in the northwest. Here, and in over a dozen other locations across the inner northeast, temporary test drill sites have been established to provide project bidders with geological information necessary to construct the 6 km underground tunnel integral to the estimated $17 billion two-phase project. The group’s presence garners honks and hollers from agitated drivers crawling past in bumper-to-bumper traffic on Alexandra Parade. They are a diverse bunch: young and old, professionals and students. Some residents have brought their dogs to sit in solidarity. They quietly mingle for some time, speaking of broken public transit promises, rushed project planning, an undisclosed business case and smokescreen community consultation efforts. Many carry signs that decry the ‘tunnel vision’ of Victoria’s Liberal-National coalition government. For six months beginning at the height of these demonstrations in January 2014, we followed the community campaign against the East West Link at a critical period during which community groups and key individuals presented their responses to the project’s Comprehensive Impact Statement (CIS) at public hearings led by a state-appointed independent Assessment Committee. During that time we attended community meetings and street protests, participated in community-initiated panel discussions and observed the public hearing sessions. We followed Twitter and Facebook discussions and trending topics, and met with over a dozen community campaign leaders to hear their stories. What happened in the two years of political power plays and community campaigning tells a story of persistent, strategic, clever and coordinated action by citizen action groups to reposition the East West Link on political agendas at the local, state and federal level. The following is a brief summary of some findings from our research into how community campaigners coordinated and led a crusade to defeat a determined government and stop what appeared to be a ‘done deal’ project in spite of the considerable odds stacked against them. The East West Link was supposed to be the sterling legacy in then-Premier Denis Napthine’s project portfolio. From May 2013 when the coalition government announced that it would fund the first phase of the cross-city road, the East West Link was touted as the connectivity-boosting, congestion-busting answer to Melbourne’s transport woes. It was a remarkable shift in priorities. The party had campaigned to victory on public transport promises just three years earlier. The new administration’s infrastructure agenda (after the shift) was strikingly reminiscent of Melbourne’s transport aspirations dating back to the 1960s. When Victorians elected the Liberal-National coalition government on November 27, 2010, a $1.55 billion multimodal public transport investment program was positioned as the solution to Melbourne’s transport and traffic challenges. The plan committed improvements to train, tram and bus services and the construction of rail links to Victoria’s two airports. A newly formed independent Public Transport Authority would oversee the development of regional rail links, a cross-country passenger rail route and new stations in the city’s middle suburbs. But these plans were destined for the cutting room floor. By 2012, the Napthine government had revived the controversial cross-city toll road and tunnel project, one of several proposals put forward in a 2008 transport feasibility study commissioned under the previous Labor government, and elevated it to the top of its infrastructure priority list. In December 2012 the East West Link was declared a major transport project of state significance under the Major Transport Projects Facilitation Act 2009. Its reappearance on the agenda of the state government occurred without formal engagement or consultation of would-be affected residents in inner east and west Melbourne or the wider community of Victorians. The project was eventually heavily criticised despite what appeared to be an in-depth stakeholder and community consultation process that culminated with the release of Plan Melbourne in early 2014, the state government’s strategic land use plan for metropolitan Melbourne, of which the cross-city toll road was a hallmark feature. As the public was being invited to comment on the impacts of the East West Link over a period of eight months, tender documents for three short-listed consortia revealed the final plans for the project were due three months before the formal consultation process was scheduled to end. The views of Victorians, local councils, community organisations, independent experts and the Environment Protection Authority would neither be known to bidders at the time they submitted their final bids, nor factored into the project’s finalised plans. In the same month that the government planned to wrap up consultation activities, the project’s shortlisted bidders were to be announced. The tight timing was widely held as an insult to the views of Victorians, a ‘sham’ of a consultation process with engagement activities mere window dressings to give the appearance that community voices were being heard. But who was listening? The East West Link was quickly positioned in the wider media and political discourse as a ‘done deal’, a must-have for future prosperity of the state, projected growth in the west and ongoing productivity of the Port of Melbourne. Furthermore, a $1.5 billion investment pledge by the newly elected Abbott government in September 2013 added to the perception that the project would go ahead. Criticisms of the East West Link were immediate. A growing chorus of critics – community and special interest groups, academics, town planners and architects – questioned the logic and reason for the un-mandated road project. From the outset, details of the East West Link’s impact were opaque. The coalition government withheld the business case that could outline key productivity figures, including the cost-benefit ratio and traffic projections for the new road. Design plans were not finalised. Investigations of potential health and environmental impacts were inadequate in scope. There was no demonstrable value for money and ongoing transparency issues had former government advisors publicly denouncing the project. Community trepidation hit a tipping point when Napthine announced he would expedite the signing of contracts using a public-private partnership delivery arrangement to get shovels in the ground. Some residents were concerned about compulsory acquisition of their homes to make way for the tunnel, the largest transport infrastructure project in the state’s history. Others were troubled by the potential loss of significant urban parklands and sensitive ecological reserves at Royal Park. Long standing public transport advocacy groups feared the project would steer limited financial resources away from much needed public transport in and around Melbourne. But the common frustration among local residents and community groups was the loss of an inclusive, democratic planning process subverting the sense of legitimacy around the East West Link. The community was shocked into action when the state government declared that construction contracts for the project would be inked just weeks before the 2014 state election, which Prime Minister Tony Abbot in the Age described as a ‘referendum on the East West Link’. They mobilised and coordinated tactics to stall the signing of the contracts, including mounting legal challenges, intensifying informational campaigns in local neighbourhoods and staging increasingly frequent and disruptive protests. 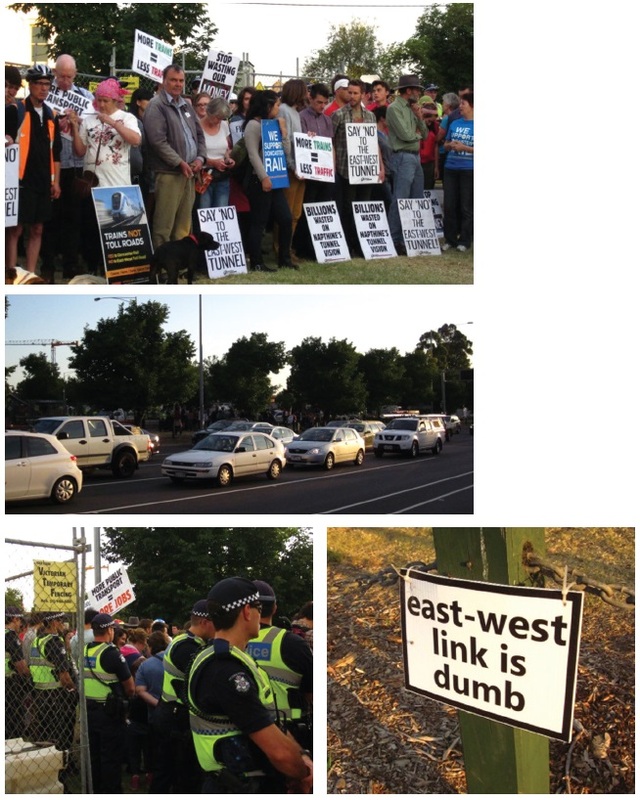 The East West Link opposition campaign was not just another NIMBY (not-in-my-backyard) offensive. Several community-based groups had an acute understanding of the significance of transport investments, not least the use of public funds to finance one piece of infrastructure above another. They were propelled into action against the Victorian Government. As the contract signing deadline neared, community-based groups and other active citizens mounted a strong case before the independent panel advising the Victorian Government on the project. Their cases – ranging from personal and professional interests to those in support of local council resistance – provided a powerful platform for debate on the role of the local community in city-defining transport projects. Beyond the walls of the hearing, community-based groups also turned their focus to influencing public debate about the future of transport in metropolitan Melbourne. These campaigns wielded the power of social media to convey public concern and disseminate publicly available information about the proposed road project, facts that were difficult to ascertain from official channels. Other groups took more traditional approaches to citizen action by organising public meetings and panel discussions to share expertise and guide thinking on alternative transport opportunities. These efforts created a dynamic space for groups to air their aversion for a road shrouded in rhetoric and political sidestepping. Most importantly, inclusive community efforts allowed groups to engage in a debate over Victoria’s transport priorities and possibilities. On November 29, 2014, the East West Link was abandoned following the defeat of the Napthine coalition government, the first Victorian administration in nearly 60 years to lose office after just one term. In his first act as Premier of Victoria, Labor’s Daniel Andrews officially terminated plans for the East West Link in late November 2014. What might Sydneysiders learn from the East West Link community campaign? Despite the heavyweight political positioning and firm efforts to fast track the project, state government decision makers confronted a political landscape of resistance and dissent from interest groups and citizens. Ongoing attempts to thwart meaningful community engagement by consulting groups only on questions surrounding mitigation and management of negative impacts, rather than whether the project ought to be the top transport priority in the first place, only served to strengthen the community’s defence. When there is an absence of clear information, substantial citizen engagement and serious deliberation around the selection of transport priorities, opposition will mount elsewhere to return balance to the scales. It’s happening right now in Sydney with WestConnex. Active, resourceful citizens are pursuing new means, sometimes even inventing new paths, to reclaim their place in democratic decision making. These include organising public forums where knowledge and information can be exchanged, preparing economic arguments in favour of alternative transport projects, appearing on local television and radio programs to present their case and even staging unusual and amusing performance protests, such as the highly publicised flash mob of 19th century ‘ghosts’ who appeared at a popular shopping centre in Melbourne awaiting a scheduled train that would never come. Citizen groups are launching savvy campaigns that are both policy-focused and directed at driving a fundamental cultural change in how Australians idealise the cities where they live, work and play. These small but mighty campaigns are grounded in the community, including those folks immediately affected by proposed routes, construction impacts and other interruptions, to others living further afield who may reap benefits or experience impacts in other ways, such as having their tax dollars funnelled into city-centric projects that will ostensibly improve their connectivity to the CBD in the long term. Set on shaping the urban policy debate, new and long established community-based groups are actively interrogating the validity of WestConnex in the same way that they did the East West Link and other contentious transport infrastructure projects of the past. Supported by long-standing advocates for public transport, these groups have multiplied the democratic platforms available for Australians to engage politically and challenge the often short-sighted directives of their state government. Skilfully calculating their manoeuvres as an undivided front, the East West Link community campaigners ultimately helped steer the Opposition to victory in the 2014 election on a clear mandate to ditch the tunnel and road project for better value transport infrastructure. By building upon a foundation of solidarity, Victorians raised the stakes of the community campaign to block the road, allowing the politics of the East West Link to transcend conceptions of NIMBYism to broader questions of democratic decision making and Melbourne’s transport future. Dr Crystal Legacy is a Research Fellow at the Centre for Urban Research RMIT University Melbourne and Daniela Minicucci is a Research Assistant at the Centre for Urban Research RMIT University. Photos by Daniela Minicucci. The academic paper “Transforming transport planning in the postpolitical era” to support this article has been accepted into the Journal Urban Studies.